In a world where bank financing is scarce, IRAs are proving to be a tremendous source of investment capital for Real Estate & other off Wall Street Investments. Find out how to invest in Real Estate and other REAL investments today. 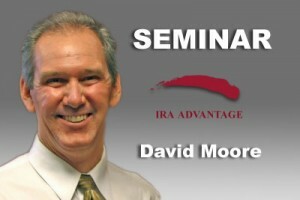 Bring your clients regarding their individual retirement accounts to get their questions answered. Presented by IRA Advantage, attend the Thursday, May 12th, 2011 Session 6:00 pm – 8:00 pm or the Thursday, May 19th, 2011 Session 10:00 am – 12:00 pm at Lincoln Center, Building 3, 10220 SW Greenburg Road, Suite 111, Portland, OR 97223.